Trades have been focused on the story of VIX this month. The CBOE Volatility Index, or VIX, has taken traders on a wild ride, rising more than 100% in a single day and causing an exchanged traded product associated with the index to collapse. VIX is also called the fear gauge because it rises as traders become fearful in market declines. The index is actually based on the price of options tied to the S&P 500 index. When that index falls, the price of put options on the index rise quickly. This pushes the VIX index up, giving rise to the belief that when selling picks up, traders are fearful and VIX reflects that fear. The level of fear, and the rise of VIX last week, is shown in the chart below. Because VIX had been at a low level for so long, a pattern that should be expected in a bull market, many traders had become accustomed to shorting VIX, allowing them to profit from the low level. They were able to do this with exchange traded products like the VelocityShares Daily Inverse VIX ST ETN (NYSE: XIV). Notice that XIV is an ETN, which is different than the more popular ETF or exchange traded fund. An ETN is an exchange traded note and is backed by derivatives while ETFs hold stocks. That difference makes ETNs riskier. When the VIX rose 100%, XIV dropped sharply, losing more than 90% of its value which is expected because XIV moves opposite to the VIX. The large loss forced the sponsor of the ETN to close the product. This attracted a great deal of interest in VIX and the trading products associated with the index. That attention led to traders focusing on the prospects of Cboe Global Markets, Inc. (Nasdaq: CBOE), the exchange where VIX is traded. Shares of the exchange dropped more than 20% during the week. Concerns related to VIX trading accounted for part of the drop and an earnings miss explained some of the decline. The exchange, which merged with Bats Global Markets last year, narrowly missed expectations for fourth-quarter revenue and profit after reporting higher expenses. But, the VIX story earned more interest. The exchange said it has seen record trading volume in VIX options and futures, each up 23% over the last year. Analysts at KBW estimated that VIX-related products and trading account for as much as 25% of Cboe’s revenue. The Cboe also said it had an 82% increase in listings of exchange-traded products. Two of the products that were listed are a focus of trading. A Credit Suisse product, the VelocityShares Daily Inverse VIX Short-Term ETN, will close after losing nearly all of its assets. But Cboe said exchange-traded products betting against the VIX account for 5% of average daily volume in VIX futures. About 21% of the investors in short-volatility products are considered non-institutional, meaning not professional traders. The majority are highly sophisticated pros, Cboe said. But more importantly, as far as Cboe is concerned, investors will continue to want to use volatility-linked products to hedge their stock market exposure. Already investor money is flooding into another short-volatility exchange-traded note now that the Credit Suisse one is winding down, they said. A ProShares fund, ProShares Short VIX Short-Term Futures (NYSE: SVXY) shot up to $700 million from $100 million in assets. “We see every change in market conditions as an opportunity to redouble our educational efforts,” said Edward Tilly, Cboe’s CEO. The comments came after the Cboe reported fourth-quarter revenue of $265 million, missing the consensus by about $2 million, and adjusted profit of $0.87 per share. Despite the CEO’s assurances, the stock sold off. The selloff could be overdone since traders are unlikely to abandon volatility trades. When a stock is expected to move higher, traders could consider obtaining long exposure to the stock to profit. A number of option trading strategies could be used to meet this objective. Among those trading strategies is a bull put spread. The risk and reward diagram is shown below and it offers limited risk with limited potential gains. However, it is well suited for a stock which is in an up trend. 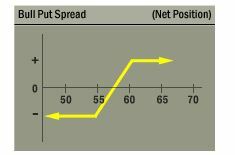 For CBOE, a bull put spread could be opened with the March 16 put options. This trade can be opened by selling the March 16 $100 put option for about $1.20 and buying the March 16 $97.50 put for about $0.85. This trade would result in a credit of $0.35, or $35 per contract since each contract covers 100 shares. That amount is also the maximum potential gain of the trade. The maximum possible risk is the difference between the exercise prices of the two options less the premium received. For this trade, the difference between exercise prices is $2.50 ($100 – $97.50). This is multiplied by 100 since each contract covers 100 shares. Subtracting the premium from that difference means, in dollar terms, the total risk on the trade is then $215 ($250 – $35). The potential gain is about 16% of the amount of capital risked. This trade will be for about one month and the annualized rate of return provides a significant gain.